Product prices and availability are accurate as of 2019-04-15 11:47:17 BST and are subject to change. Any price and availability information displayed on http://www.amazon.com/ at the time of purchase will apply to the purchase of this product. Turn up the volume and see exactly what 2 8W motorists and 2 passive subwoofers can do. 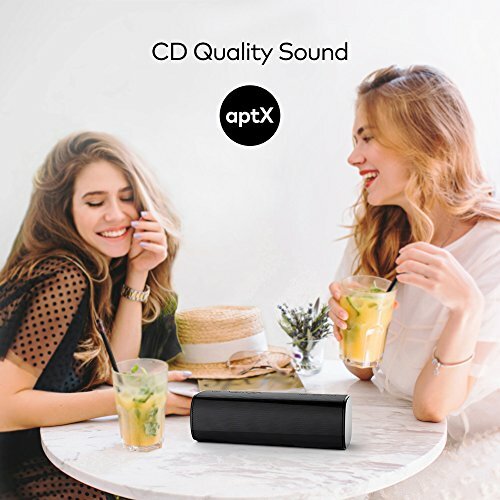 Release earth-shattering bass and get it all out, beat after beat, with the supreme combo of aptX audio coding and Bluetooth 4.0 connection. Stop worrying about a little water sprinkling your speaker. Get the party going no matter where you are, whether that is at house, on the beach, and even by the glittering water of the pool. The speaker's rubber-reinforced style and its IPX5 splash evidence rating make it the very best party companion in any scenario. 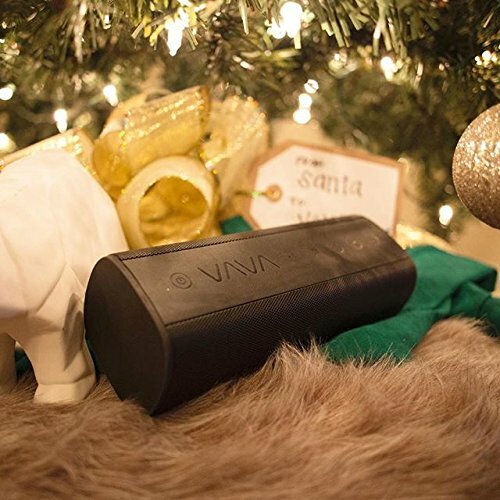 When Enjoyable calls, VAVA is the response. Imagine 10 hours of continuous music streaming with the volume set at 80% of its maximum power. Imagine several celebrations in different put on a single charge. Well, VAVA made it real. The rechargeable 5200mAh lithium-ion battery has enough power to spare: besides partying all night, you can use it to power up your USB devices thanks to the built-in 5V/1A charging port. 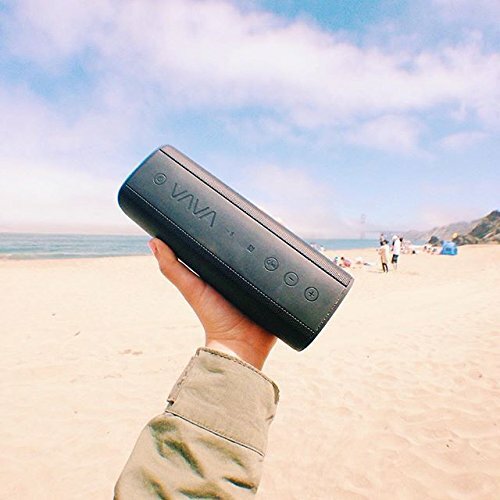 Whether it is via NFC, Bluetooth 4.0, or a traditional 3.5 mm AUX audio cable, it'll be simply as simple to connect the VAVA Voom20 and get the music pounding. If it is via Bluetooth connection you choose to choose, prepare to delight in approximately 2 devices matched simultaneously and the possibility to effortlessly switch from one to the other at will. Free the DJ inside you and AWE the enjoyable out of your good friends. THE VOICE OF POWER: Two powerful 8W drivers that deliver an over-the-edge loud sound that'll AWE your friends, plus aptX audio coding paired with Bluetooth 4.0 connectivity for premium CD-quality audio experience without the nuisance of wires. 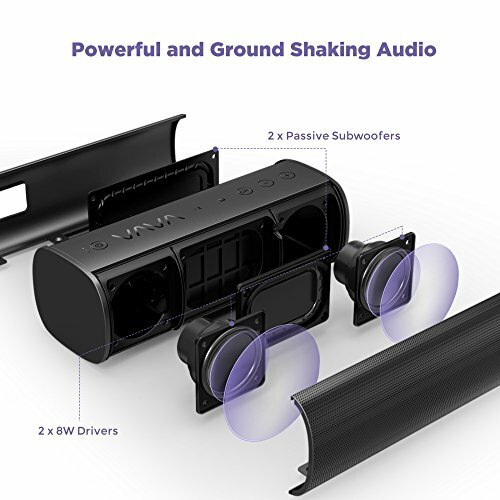 BASS THAT'LL BLOW YOU AWAY: Let the bass equalizer make the most out of the dual passive subwoofers and squeeze every last bit of "thump" out of your music. EVEN WATER WON'T STOP IT: Experience an extremely durable and IPX5 splash proof rubberized design to enjoy your music indoors as well as outdoors. Whether you're at the swimming pool or partying on the beach, don't let a little water spoil the fun. MADE TO OUTLAST: Enjoy up to 10 hours of music streaming with the volume set at a blowing 80% of its power. Get the party started and keep it going with its rechargeable 5200mAh lithium-ion battery. Enough power to spare and even juice your phone back up thanks to the built-in 5V/1A charging port. LIFETIME WARRANTY: At VAVA, we believe in our products. That's why we back the VAVA Voom with a lifetime warranty & 180 days money back guarantee. CONNECTIVITY KNOWS NO LIMIT: Rely on the speaker's multipoint Bluetooth connectivity to pair up to 2 devices at once and seamlessly switch from one to the other. Besides Bluetooth, the device comes with built-in NFC and an included 3.5 audio cable for further connectivity options.